Beard Oil from Great British Grooming Co is part of the product range that is available from their website, and also from the High street chain Superdrug and it has to be the worst oil I have used, it may be cheap and easily available but I have now received 145 beard care products and this is by far the worst! The Great British Grooming Co product range has a sleek black branding that is somewhat similar to your generic men’s grooming products. A smart clean look will likely draw in the shoppers and would make a fine-looking gift for the bearded man in your life! The 75ml beard oil is in a plastic bottle with a pump applicator and comes boxed for £8.99 available from Superdrug or the website. The scent is very much like many men’s products that can be bought on the high street. I have to say, unfortunately I am somewhat disappointed by this oil, unlike many oils that are available, this just feels like an attempt by a large company to cash in on the beard grooming market. Its ingredients are Paraffinum Liquidum (Paraffin Oil), Argan Oil, Kernel oil (often peach), Linalool (a naturally occurring terpene alcohol chemical found in many flowers and spice plants), Coumarin (a phytochemical with a vanilla like flavour), Eugenol ( a pale yellow oily liquid extracted from certain essential oils especially from clove oil), Limonene (a colorless liquid which often possesses a scent of oranges) and Cinnamal (a yellow oily liquid that gives cinnamon its spice). 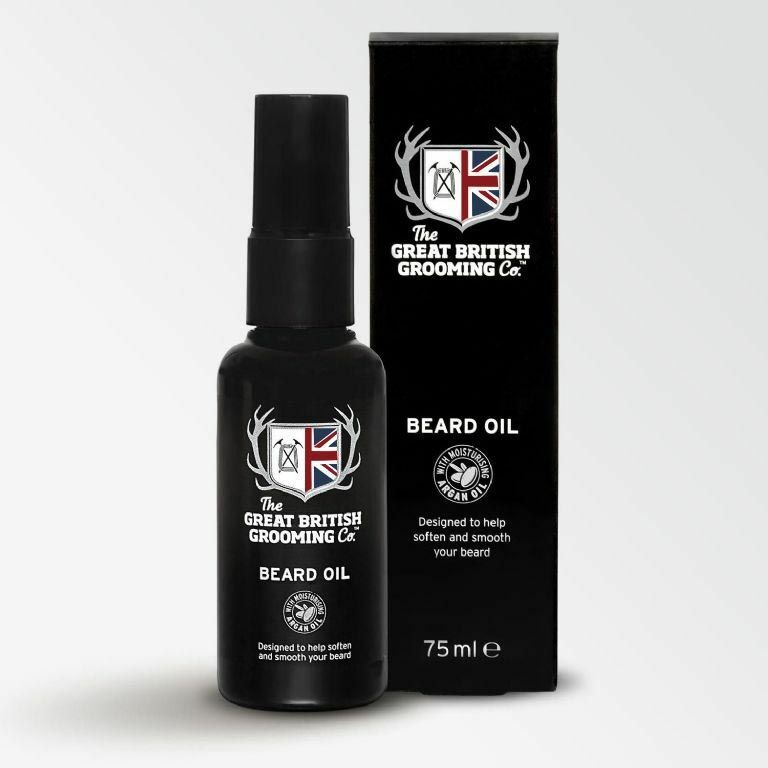 This Beard oil from The Great British Grooming Co is a clear thin oil that I feel is bulked up using liquid paraffin. Unfortunately it left my beard feeling dry after a few hours and I stopped the test after two days instead of the three days that I would normally test. If this is the only beard oil you have used, you are firstly missing out on some great oils and secondly you may not understand why beard oils are so popular. I get no pleasure at all from criticising a product, in fact I hate doing it, but I firmly believe that the best products are those that are small batch made by one or two man companies, these are often bearded men who started off making beard oil for themselves and the quality of the products are first class.